Google unveiled a new search engine result page (SERP) layout for small businesses in certain industries that will bring them front and center. This new local search layout allows for small businesses to be prominently displayed on the first page of the SERP when customers search for local businesses via their desktop computer. This is a great change for small business. It will help your business become more competitive with national chains by giving you more visibility when a customer searches for your products/services. So, we thought we’d give you the basics about the changes and what this change might mean for your small business. What business verticals does this affect? Currently, this change affects restaurants, bars, hotels, and entertainment-focused businesses such as theaters, museums, and art galleries. If your business isn’t in these categories, it doesn’t mean this change isn’t coming to your industry soon, so keep a look out. What does the new SERP look like? When a customer performs a search query in one of the supported categories, Google now displays results in a horizontal “carousel” across the top of the page. Businesses logos and/or images are displayed within the “carousel” and display the business’ name, photos, rating and review information. How is my Google Search position determined? 1. 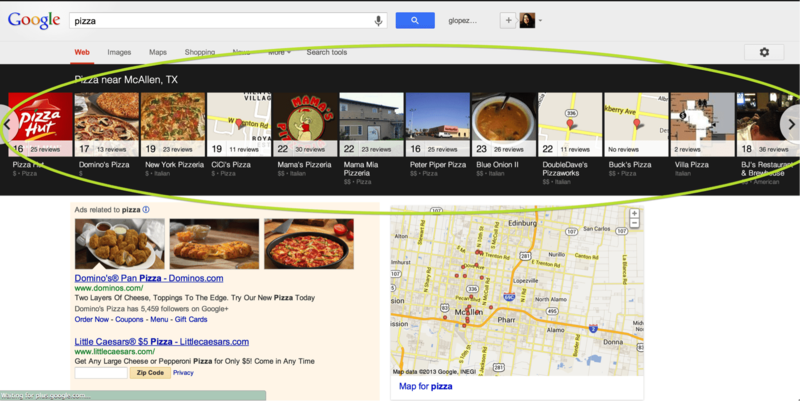 Results are tied to your Google+ Local Map Listing. This is a great thing for your business; all you have to do is ensure that you have set up your free Google+ Local listing. So, every time a customer searches for your category plus a geographic keyword (zip code, or city) your business information will show. 2. Feature a single image. These images will be pulled in from your businesses Google+ Local page, so it is important that your page contains relevant images that can be pulled into your business’ carousel listing. You want these photos to be enticing, and eye-catching. Also, keep in mind that Google determines which image will be used, so ensure all your images represent your business’ services and products. 3. Rating number appears on carousel if you have one. This is important because customers get a quick view of what others are saying about you. This means you need to ensure you are monitoring what your customers are saying online, especially on Google+ Local. You need to be proactive about responding to negative reviews and ask your happy customers to leave you positive reviews to help boost your overall rating and increase the number of reviews. 4. Clicks on your carousel result turn into a branded search. Now when a customer clicks on the business link from the carousel results, it changes the SERP below the carousel to reflect those results. This feature makes your business online presence more important than ever! Consumers can now easily go from searching generic local keywords to a specific search for your business in just one click. This means you need to be sure that correct and accurate information appears when you search for your business. Also, make sure you’ve claimed your social media pages, are creating content, and monitoring your online reputation on sites like Yelp, Foursquare and Citysearch, whose reviews often show up in search results. You can also make note when you click on your listing in the carousel what search term is automatically created for your business, and incorporate this long-tail keyword into your search engine optimization strategy. 5. The branded search can display ads in addition to organic results. With this update the branded search will not only display organic results, but also will feature up to two paid search ads directly under the carousel listing. These changes are a great opportunity for local business to get online exposure. Just ensure your business it ready for it!